Many car accidents happen when motorists are texting or using their cell phone. Government has passed legislation making it illegal in Toronto to operate a cell phone without a headset, or text while driving a car. If you’re caught operating a cell phone or texting while driving, you will have to pay a set fine, depending on the Municipality where the offence has occurred. For claims in Toronto, this will mean that the motorist responsible for the car accident will be charged under the Highway Traffic Act, and will have to pay a set fine of up to $500; if not higher. 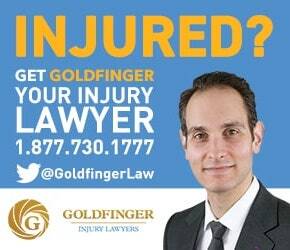 Goldfinger Law is one of the most successful and prestigious personal injury law firms in Toronto, with affiliate offices in London and Peterborough. Goldfinger Law represents car accident victims across Ontario and has recovered millions of dollars in damages arising from car accident claims. Estimates say that between 10-25% of all car accidents in Ontario have arisen as a result of a driver not paying attention to the road on account of cell phone or smart phone usage. Smart phones with email and web browsing capabilities are on the rise. Despite government legislation making it illegal to operate a cell phone or text and drive, the trend for these sort of car accidents in Toronto and across Ontario is bound to rise. The increasing prominence and popularity of I-Phones, Android Phones and Blackberry Phones all make the likelihood of these sort of car accidents greater.